The world of French sparkling wine ventures in California began in 1973, when Moët et Chandon established Domaine Chandon. This was followed by Mumm Cuvée Napa (1979) and Roederer Estate (1982). The idea was no longer novel by the time Domaine Carneros came along in 1987, but they had several things going for them. The Taittinger name was familiar to many Americans, and the graceful style of the wine was comfortable to them as well; when it was transplanted to California, it became even riper and more appealing. They also had Eileen Crane. After studying at the Culinary Institute of America and taking courses in enology and viticulture at U.C. Davis, Crane took a job as a tour guide at Domaine Chandon in 1978 and worked her way up to assistant winemaker. She was hired away by Gloria Ferrer in 1984 to supervise the construction of their sparkling wine facility in Sonoma. Three years later, the Taittingers selected her to build and supervise their operation in Carneros. In addition to good judgment, the family also had a level of wealth that was stunning---even by California standards. The winery they built turned out to be a monumental, European-style chateau that would not be out of place as the home of a First Growth in the Gironde. Their resources also allowed them to purchase a 138-acre vineyard that provided the last piece of the puzzle: the ability to produce high-quality California sparkling wine from estate-grown fruit. Crane is still there 31 years later, and Domaine Carneros makes 95% of their wine from estate vineyards in the Carneros AVA. The operation is also a joint venture with Kobrand, a multinational distributor of wine and spirits that has placed the product in fine dining establishments across America. The bulk of the 60,000 cases consists of the vintage-dated Brut Cuvée. 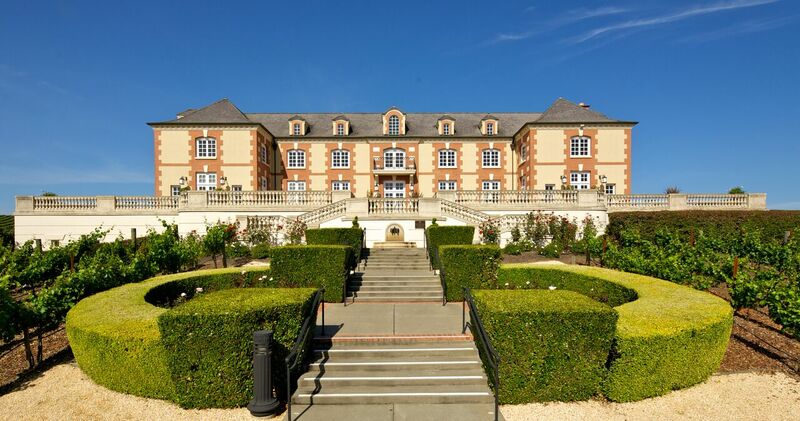 Just as Taittinger in France has Comtes de Champagne as the apex of their portfolio, Domaine Carneros makes a tiny amount of their own luxury cuvée, Le Rêve (“the dream”). The 2012 Le Rêve ($105) is a Blanc de Blancs consisting of 100% estate-grown Chardonnay. The nose is clean and fresh, with floral tones and notes of vanilla and almonds. In terms of taste, this wine is the gift that keeps on giving. It is vibrant and assertive on entry, with classic Chardonnay flavors of citrus, melon and pear. In the mid palate, the bright acidity takes those flavors and magnifies them, leaving a lush core of green apple on the finish, with hints of lemon cream pie on the extreme length. In a word, Le Rêve is simply luscious. For most consumers, Le Rêve Rosé doesn’t really exist: it’s only sold at the winery and to mailing list members, and availability is limited to “a brief time each holiday season.” The 2012 version ($135) has a very pale salmon color and a racy nose with faint aromas of red fruits. The wine is rich and full-bodied on the palate, with expansive flavors of wild strawberries and red currants resting on a firm mineral backbone. The fruit lingers, resolving into an essence of red berries that echoes on a succulent finish. Elegant and memorable, this is a wine that compares to some of the best rosé Champagne on the market.